Growing up in the 1950s, our father often spoke of his mother’s home in Ireland. Although he never visited Ireland, he kept her memory alive with stories from the past. In the late 1800s Grandmother Mary Jane Carolan immigrated to New York City when she was a young woman. My sister, Mary, has researched our family genealogy for many years, but we still had many unanswered questions and no living relatives to ask. We decided it was time to visit Ireland and find the family farm. About 6 weeks before our trip, we found genealogist Sean Quinn’s name & his website, My Ireland Heritage, in Rick Steve’s 2017 Ireland travel book. After some online research, we sent an email to My Ireland Heritage and received an immediate response from Aisling. We completed a questionnaire with some basic information about our ancestors and had a follow up conference call with Sean. His interest and willingness to work with us was very encouraging. After many years of research and discussions, we felt this was a “once in a lifetime opportunity” and hoped that Sean would be able to provide the answers we needed. Sean & Aisling stayed in touch with us prior to our trip and kept us informed about the research and reconnaissance being done. After spending a week touring Ireland, we met Sean at our hotel in Trim, County Meath. Sean was full of enthusiasm and excitement about the results of his research on the Carolan family. As we drove to Nobber, a very small village, Sean pointed out important sites and their historical significance along the way. First we visited Old St. John’s Cemetery in Nobber, which was restored in 2004. Sean immediately directed us to the grave site of our great uncle, Philip Carolan (1874-1901), our grandmother’s brother. 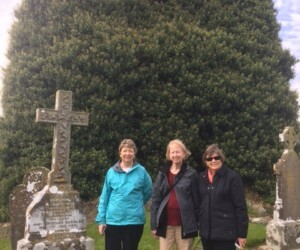 Our great grandfather had erected a beautiful large stone cross when Philip died. A 2nd cousin, Charlie Carolan (1906-1984), was also buried at this grave site. It is assumed that other ancestors are buried there as well. Sean provided daffodil bulbs for each of us to bury at the grave. This was an overwhelming experience! Sean then took us to visit the new Catholic Church, St. John the Baptist, and the Main Street of Nobber. But the best was yet to come. Sean drove out of town into the farm land and on a small country lane Sean stopped at the “ruins” of our grandmother’s ancestral home. Stepping through the doorway of our great grandparents’ home, the home where our grandmother was born, was like going back in time. As we walked through the ruins of the home, Sean pointed out the fireplaces, loft, and living spaces and spoke about the way people lived in the late 1800s. Walking the land and the beautiful fields behind the house was incredible. These are memories that we will never forget. To document that this was truly our family’s home, we stopped at a neighbour’s home down the road. Sean had met the neighbours as part of his reconnaissance of the area prior to our visit. The neighbours were friends of our 2nd cousin, Charlie, who died in 1984 and who’s grave we visited earlier in the day. They shared stories about Charlie and brought his memory alive. They confirmed that Charlie was the last of our family in Nobber. All of the other relatives, including Charlie’s brother, had gone to America. With all of our research, we never could have put together the day that Sean gave us in Nobber. He also provided documentation in a beautifully bound book and a painting of the ruins of the family home, which his wife had done. This was truly a once in a lifetime experience thanks to Sean, Aisling, and the My Ireland Heritage team. The sister were a joy to work with and the facts were outstanding. 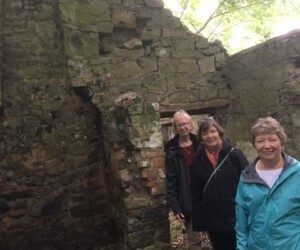 We at My Ireland Heritage will only work with the Facts so too find and walk amongst the ruins were special of the old House and Forge which lay at the rear of the property. Bring the historic side was also a delight as we found an Old Norman Motte and Bailey from 1169 AD and also the Graves of the Carolans were very close to the Family of Cruise who once used this old Motte and Tower House close by at Nobber.